We’d love your help. Let us know what’s wrong with this preview of Marrying a SEAL, Marrying a Stranger by Summer Hines. Only a month out from a special election for State Senate, focused and ambitious Anna Kelly can't make her numbers budge. Until she meets Chris Webb, a laconic Navy SEAL with a crazy idea. Maybe he could help her out: a brief engagement, she wins the election, he ships out, and they divorce. Easy as apple pie. Two people on very different courses, they don't expect to have Only a month out from a special election for State Senate, focused and ambitious Anna Kelly can't make her numbers budge. Until she meets Chris Webb, a laconic Navy SEAL with a crazy idea. Maybe he could help her out: a brief engagement, she wins the election, he ships out, and they divorce. Easy as apple pie. Two people on very different courses, they don't expect to have much in common, but as circumstances contrive to keep them together, they realize they might be getting more than they bargained for. Summer Hines delivers another story with all the best ingredients of a traditional romance, with sharp dialogue, fully-realized characters, real stakes, and--best of all--fiery chemistry between her whip-smart heroine and brooding SEAL. To ask other readers questions about Marrying a SEAL, Marrying a Stranger, please sign up. 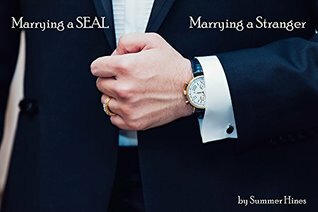 The full title of the book is Marrying a SEAL, Marrying a stranger but felt it was to long, so just for this review post I have shortened it to Marrying a SEAL. I received this book from the author for free, against a honest review. This is such a fun, quick and soft romantic book, perfect for this late summer nights when you do not want to strain your head with something heavy. Or this is one of those perfect books to read when you have a You can read more of my reviews at my blog The Book Chick. Anna is an ambitious, young woman who is running for state senate. Due to that she is a woman, young and according to a lot of people, inexperienced, the polls do not look so good. And with only one month left to the election is over she need to do something drastic. In walks Chris with his asinine idea that they should get married, pretend for a while and after he has shipped out, they can just get an divorce. Easy peasy, right? Well .... no. Not exactly. I'm a reader, first and foremost. I think there comes a point in the life a reader where the impulse to live a different life through a story becomes the impulse to create a different life through a story, and that moment came for me just after the birth of my son, when I wrote her first book, "Some Things Stay With You". I like to write using the traditional tropes of romance novels, and I love t I'm a reader, first and foremost. I think there comes a point in the life a reader where the impulse to live a different life through a story becomes the impulse to create a different life through a story, and that moment came for me just after the birth of my son, when I wrote her first book, "Some Things Stay With You". I like to write using the traditional tropes of romance novels, and I love the challenge of filling what might be a cliched moment full of life and sincerity. I live in Seattle with my husband, small son, and collection of Babysitters Club Super Specials.